Visuallizing Why US National and US State Governments’ GHG Reductions Commitments Are Now Woefully Inadequate in Light Of Recent Science. 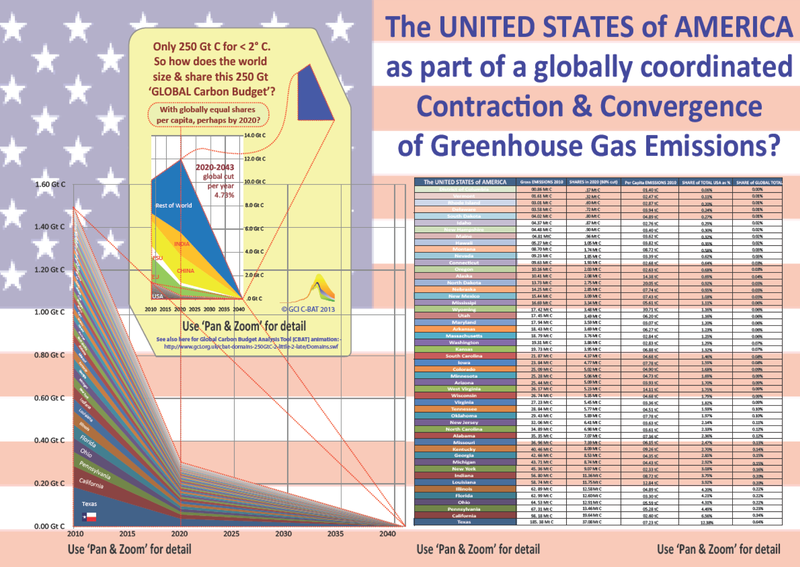 Several charts produced by the Global Commons Institute vividly demonstrate the woeful inadequacy of both the US federal government’s and US states’ commitments on climate change in light of the most recent climate change science. These charts are extremely important because there is virtually no discussion in the US press of the utter and undeniable inadequacy of commitments on climate change made by the US federal and state governments. These charts help visualize complex information that is not well understood by the vast majority of US citizens, yet these facts must be understood to comprehend the utter inadequacy of the US federal government and US state governments response to climate change. Thus, these charts help explain both why the US commitment to reduce its ghg emissions by 17% below 2005 as well as targets that have been set by even those US states which have shown some leadership on climate change must now be understood as utterly inadequate in light of the most recent climate change science. As we shall see below, in setting a government target for ghg emissions two clusters of issues need to be considered which have largely been ignored when US policy makers have set ghg emissions targets. One is the issue of global carbon budgets for the entire world needed to prevent dangerous climate change. We will call this the carbon budget issue. The second is the unquestionable need of all governments to set a target in light of that government’s fair share of safe global emissions. This is required by distributive justice. We will call this the equity or justice issue. All ghg emissions targets are implicitly a positions on the carbon budget issue and the equity and justice issue, yet policy makers rarely discuss their implicit positions on these issues and the US media is largely not covering the budget and justice issues implicit in any US policy on climate change. Any entities identifying a ghg emissions reduction target must be expected to expressly identify their assumptions about what remaining carbon budget and justice and equity consideration were made in setting the target. I. The First Chart-US States’ Emissions Reductions Commitments Required to Prevent Dangerous Climate Change and Adjusted To Take Equity Into Account. The following chart depicts what US states emissions commitments should be to prevent dangerous climate change in light of the most recent climate change science and the need to take justice into account in setting ghg emissions targets. This chart can be examined in more detail on the Global Commons Institute website at http://www.gci.org.uk/images/Don_Brown_All_State_draft_[complete].pdf Clinking on this URL should access a pdf file that will allow for a closer inspection of this chart which can be further enhanced by using the zoom function. What is most notable about this chart is that the US federal government and US state g0vernments will need to reduce their ghg emissions extraordinarily steeply in the next few decades, far beyond what has been committed to. This chart, in combination with the next chart, helps visualize why the current commitments of even those US states which have demonstrated some considerable leadership on climate change need to be increased to levels that represent the state’s fair share of safe global emissions. These steep reductions commitments are needed in light of the most recent scientific understanding of the climate problem facing the world. A carbon emissions budget for the entire world is needed to prevent dangerous climate change and was identified by IPCC in 2013. This budget is of profound significance for national and state and regional ghg emissions reductions targets yet it is infrequently being discussed in global media and has virtually been completely ignored by the US media. To give the world an approximately 66% chance of keeping warming below 2 degrees C, the entire global community must work together to keep global ghg emissions from exceeding approximately 250 metric gigatons of carbon dioxide equivalent. The 250 metric gigatonne budget figure has been widely recognized as a reasonable budget goal by many scientists and organizations including most recently the International Geosphere Biosphere Program. The 250 metric ton number is based upon IPCC’s original budget number after adjusting for carbon equivalence of non-CO2 gases that have already been emitted but were not considered initially by IPCC. The practical meaning of this budget is that when the 250 gigtatons of carbon dioxide equivalent emissions have been emitted the entire world’s ghg emissions must be zero to give reasonable hope of limiting warming to the 2 degrees C. Since the world is now emitting carbon dioxide equivalent emissions at approximately 10 metric gigatons per year, the world will run out of emissions under the budget in approximately 25 years at current emissions rates. This is a daunting challenge for the world particularly in light of the fact that global emissions levels continue to increase. Although there has been some very limited discussion of this in the US press, the staggering global challenge entailed by keeping global emission within a roughly 250 gigaton budget, not to mention a budget premised on 1.5 degrees C, does not take into account the additional undeniable need of high-emitting nations, states, and regional governments to take equity and distributive justice into account in setting ghg emissions reduction targets is not being covered in US media hardly at all. 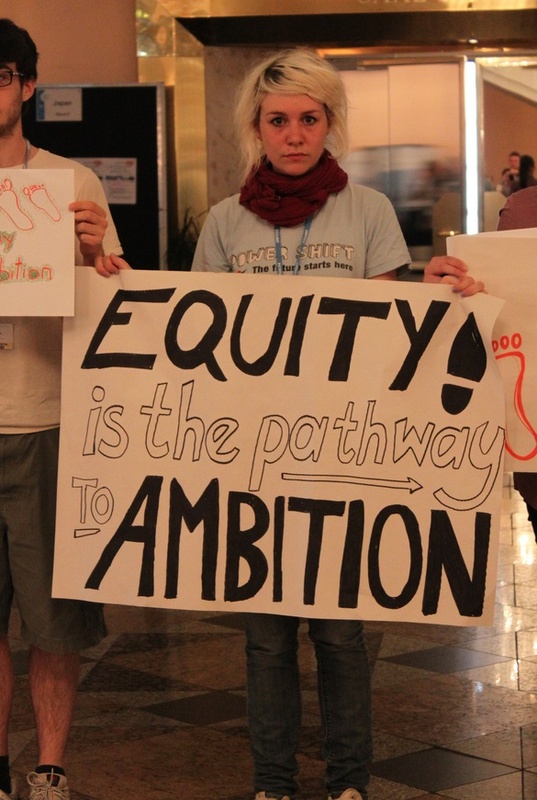 (1) Allocating emissions among nations to achieve a global target is inherently a problem of distributive justice. To not take justice into account in quantifying ghg emissions targets guarantees an unjust global response to climate change. (2) All nations including the United States have already agreed to reduce their emissions based upon “equity,” not national self-interest when they ratified the United Nation Framework Convention on Climate Change. (3) To not consider justice when a developed nation sets a ghg reduction target would be extraordinarily and obviously unfair to poor, low emitting nations, many of which are most vulnerable to the harshest climate change impacts and have done little to cause the existing problem. Yet, for the purposes of showing the utter inadequacy of existing US federal government and US state commitments, the C&C framework is very useful because other equity frameworks which have received some attention and respect in international discussions of what equity requires of nations would require even steeper reductions for the US and US state governments. 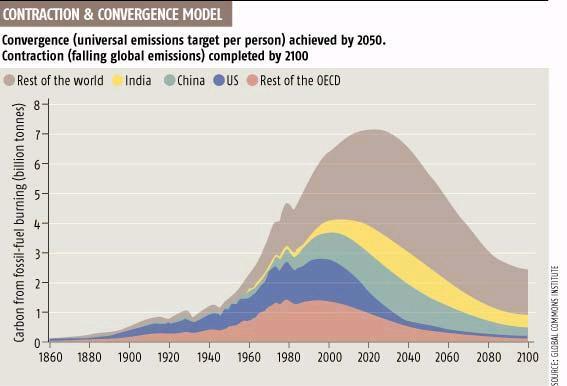 For instance the GDR framework would require the US to be carbon negative by between 2025 and 2030. 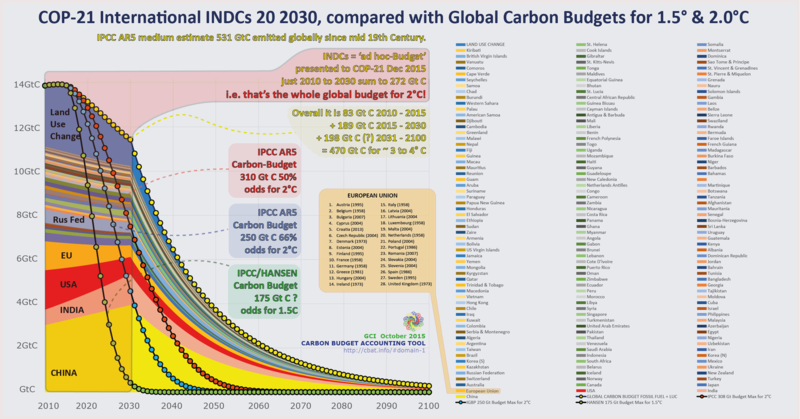 The C&C framework is therefore a very non-controversial way of demonstrating the utter inadequacy of developed nations ghg emissions reductions commitments because other equity frameworks would require even greater reductions from developed countries. Like any attempt to determine what a ghg national target should be, the above chart makes a few assumptions, including but not limited to, about what equity requires not only of the United States but of individual states, when global emissions will peak, and what the carbon emissions budget should be to avoid dangerous climate change. 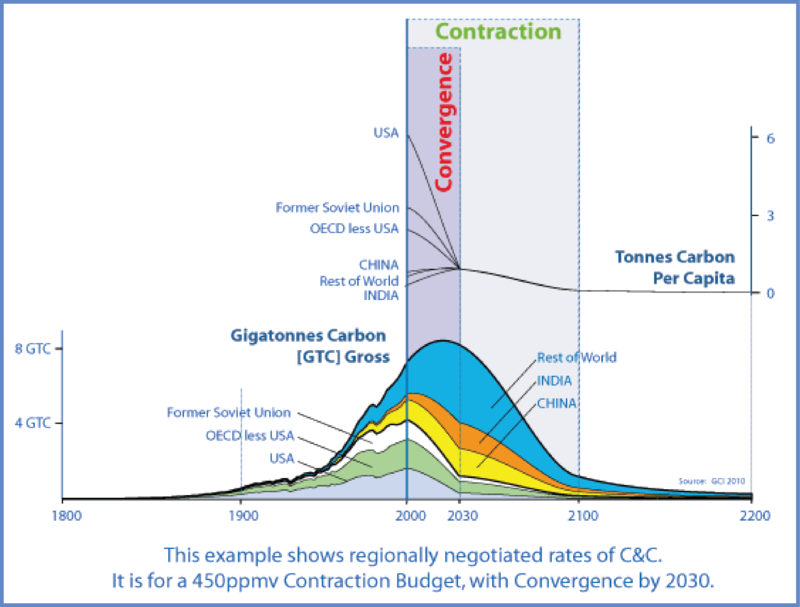 Although different assumptions would lead to different slopes of the emissions reductions pathways that are needed to remain below the 250 gigaton global carbon limitation, the chart depicts very reasonable assumptions about what needs to be done to stay within the 250 gigaton carbon equivalent budget while taking equity into account. And so, without doubt the US government and US state’s targets are woefully inadequate. To stay within the 250 gigaton carbon equivalent budget, total US emissions which will be comprised of emissions from all states must achieve carbon neutrality by 2050. Even the most aggressive US state targets are woefully short of this goal. 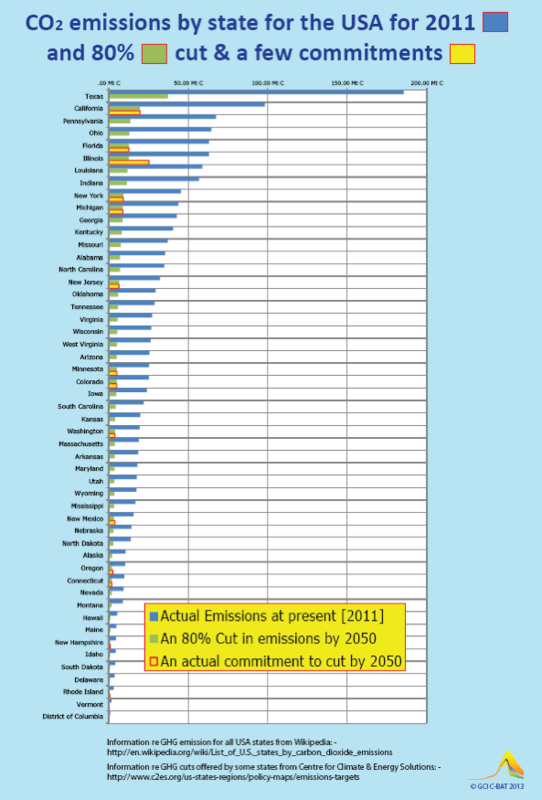 In addition most US states have no emissions reduction target at all. The US will need to achieve carbon neutrality by 2050, and this national requirement will will require US states to work together to achieve carbon neutrality. The US government could achieve the goal of reaching carbon neutrality by 2050 by relying on different approaches in different states, yet the individual states must assume they have a duty to limit their ghg emissions to levels that constitute their fair share of safe global emissions and in the absence of a federal plan that would allow them to do otherwise, states must achieve zero carbon emissions by 2050 and the above chart is a good example of what is required of them in total. II. The Second Chart-US States Existing Commitments Compared to an 80% Reduction By 2050. A few states have set ghg emissions reduction targets of 80 % by 2050. The next chart shows the quantify of reductions that each state would need to achieve to reach an 80% reduction by 2050 although we have already established above that the most recent science would require each state to achieve carbon neutrality by 2o50. What is notable about this chart is that most US states have made no ghg emissions reductions commitments at all, only a few have made a commitment of an 80% reduction by 2050 which is still not stringent enough to meet the goal of carbon neutrality by 2050, and that some states such as Texas need to achievehuge emissions reductions if the US is going to do its fair share of staying within the 250 metric gigaton carbon equivalent budget. These charts help visualize the enormity of the challenge facing the United States federal government and US state governments in light of the challenge facing the world as understood by the vast majority of mainstream scientists. There has been almost no coverage of this reality in the US media. these two clusters of issues in fact they implicitly do this. Yet government rarely explain what assumptions about the carbon budget and equity and justice issues they have made when setting their target. A Comprehensive Ethical Analysis of the Copenhagen Accord. If climate change must be understood as a civilization challenging ethical problem, what can be said about the positions taken by governments and results achieved at the recently concluded Copenhagen conference? For more than twenty years some nations have been taking positions on climate change that raise serious ethical concerns. Copenhagen meeting was no exception. However, as we saw in a prior ClimateEthics post, there were two issues that arose with a new force in Copenhagen. They were the intensity and frequency of calls for: (a) global justice, and (b) increased funding for adaptation programs in vulnerable developing countries. 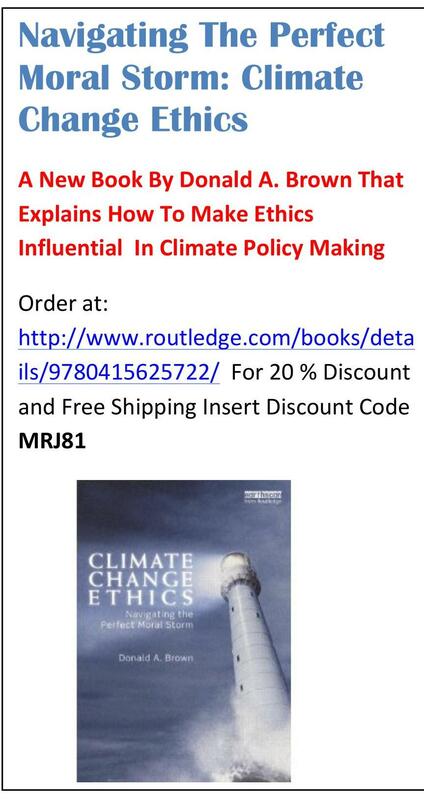 See, ClimateEthics, Two Climate Change Matters Move To Center Stage In Copenhagen With Profound Implications for Developed Nations: Ethics and Adaptation, http://climateethics.org/?p=331. Yet, at the conclusion of the Copenhagen conference, as we shall see, little was accomplished in response to these issues or the other climate change disputes that have now plagued climate negotiations for almost two decades. Although, as we shall see, some have pointed to a few positive Copenhagen outcomes, most observers have judged COP-15 to be a disaster. •	Arguments about whether Copenhagen was a disaster or a positive step forward. The Copenhagen conference took place from December 7-19, 2009. Copenhagen was intended to be the culmination of a two-year negotiating process that was agreed to in Bali, Indonesia, in December 2007. 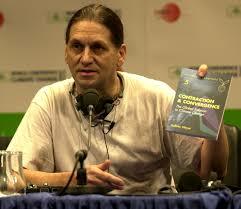 In 1990 negotiations began that led in 1992 to opening for signature and ratification of the UNFCCC. This treaty itself does not contain binding greenhouse gas (GHG) emissions limitations for countries but nevertheless includes numerous other binding national climate change obligations. To understand the significance of what happened in Copenhagen, it is necessary to understand the goals and objectives for an international climate regime that were originally set out in the UNFCCC. Among other things, for instance, the parties to the UNFCCC agreed that: (a) They would adopt policies and measures to prevent dangerous anthropogenic interference with the climate system, (b) Developed countries should take the first steps to do this, and (c) Nations have common but differentiated responsibilities to prevent climate change, (d) Nations may not use scientific uncertainty as an excuse for not taking action, and (e) Nations should reduce their GHG emissions based upon “equity.” (UN, 1992) As we shall see, some national proposals in Copenhagen, seventeen years after the UNFCCC was agreed upon, failed to abide by many promises made by governments in the UNFCCC. As of December 2009, the UNFCCC had 192 parties, a number that includes almost all countries in the world including the United States which ratified the UNFCCC in 1994. The UNFCC is a “framework” convention because it has always been expected that additional requirements would be added to the framework in updates that are known as “protocols” or in annual decisions of the conferences of the parties. The first major addition to the UNFCCC was the Kyoto Protocol which was negotiated in 1997 because the international community had been convinced by emerging climate change science that developed nations needed to be bound by numerical emissions reductions targets. The Kyoto Protocol entered into force on February 16, 2005 and currently has 190 parties. The United States is the only developed country that never ratified the Kyoto Protocol. Under the Kyoto, Protocol, the developed countries agreed to reduce their overall emissions of six greenhouse gases by an average of 5.2% below 1990 levels between 2008-2012. The developing countries had no binding emissions reductions obligations under Kyoto. The Copenhagen negotiations were necessary because the emissions reductions obligations of developed countries set out in the Kyoto Protocol expire in 2012. At climate negotiations at COP-13 in Bali, Indonesia in 2007, parties to the UNFCCC agreed to replace the Kyoto Protocol with an agreement that would create a second commitment period under the UNFCCC and would include binding emissions reductions for developed countries and new programs on adaptation for developing countries, deforestation, finance, technology transfer, and capacity building. This agreement is referred to as the Bali Roadmap which also called for articulating a “shared vision for long-term cooperative action,” including a long-term global goal for emission reductions. The Bali decision also recognized that developing countries could make contributions to solving the climate change through the development of Nationally Appropriate Mitigation Actions (NAMAs), that is climate change strategies for developing countries. The NAMAs, however, would not constitute binding emissions reduction requirements for developing countries in contrast to the binding obligations of developed countries in the Kyoto Protocol that would be further developed in Copenhagen. At Bali the parties also agreed on a two-year negotiating process to achieve the objectives of the Bali Roadmap. Under this action plan, nations would proceed on two negotiation tracks. One under the UNFCCC and the other under the Kyoto Protocol. The first track was know by the acronym “AWG-KP,” standing for the Ad hoc Working Group on the Kyoto Protocol. The second track was referred to as “AWG-LCA,” standing for the Ad hoc Working Group on Long-term Cooperative Action. The Bali agreement also included a deadline for concluding these negotiations in Copenhagen in December of 2009. Intense negotiations in preparation for Copenhagen took place during the two years between Bali and Copenhagen including four separate meetings in 2009 alone. In these deliberations, many contentious issues surfaced. 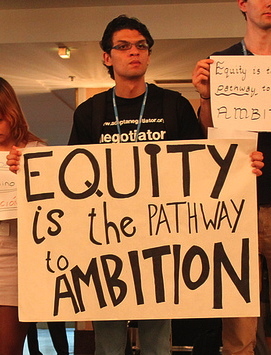 Among other things, these disputes included particularly strong disagreements about the magnitude of developed country emissions reduction commitments and institutional arrangements and funding amounts for financing developing country needs for technology cooperation, adaptation, reducing emissions from deforestation, and capacity building. Although some progress was made on a few issues in the two year lead-up to Copenhagen, little progress was made on the major issues and particularly on commitments for GHG emissions reductions and funding for adaptation, deforestation programs, and technology transfer.